What are POSI programmable feeders? 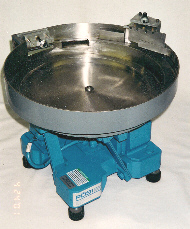 Unlike hard tooled feeders, POSI programmable feeders can be designed to orient a wide range of parts with one feeder. The versatility and rapid changeover provided by these feeders make them ideal for flexible manufacturing where a number of traditional parts feeders might be required or where the volume of any one part might not justify the use of a parts feeder. They are also well suited to mass production where a change in the parts being fed can be readily accommodated. POSI programmable feeders are designed, using standard programmable tooling modules, to feed a particular family of parts -- as defined by the customer. The part family and the required feed rate determine the size and type of feeder to be used i.e. 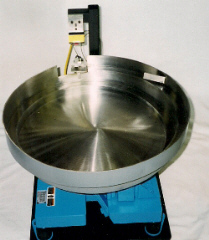 vibratory feeder with cascade bowl, vibratory feeder with an outside track bowl, or a rotary orienting feeder. The part family and the desired orientation determine the family of programmable feeder i.e. Model I, Model II, or Model III. POSI programmable feeders that are tooled without vision systems are members of the Model I family. These units only use programmable or adjustable mechanical tooling modules. Although much less sophisticated than the other models of programmable feeders, these units are well suited to orienting simple parts such as headed parts and parts that have no end-to-end or side-to-side differences. Changeover of the feeder for a different part is just a matter of programming the mechanical tooling modules, a process that typically only requires a couple of minutes. POSI programmable feeders that use a camera or vision sensor as part of the bowl tooling are members of the Model II family. The additon of a vision system provides the flexibility to handle a wide range of parts in a bowl and allows orientation of parts that would be extremely difficult, if not impossible, to orient with conventional mechanical tooling. These units may employ programmable mechanical tooling modules or they may use conventional tooling to pre-orient the parts for the vision system. The vision system is positioned in a location where the mechanical tooling elements have ensured that the parts passing it will be one high and one wide. The vision sytem monitors the flow of parts to determine if each part is the desired part in the desired orientation. In the simplest implementation incorrect parts and incorrectly oriented parts are rejected back into the feeder. Only the desired part in the desired orientation is allowed to continue to the feeder discharge. Programming a Model II feeder for a different part is simply a matter of programming the mechanical tooling modules and the vision system -- a process that can usually be accomplished in a few minutes. 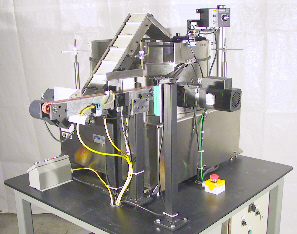 Model III programmable feeders use a conveyor to carry parts past the vision system. This configuration can provide more flexibility in positioning the camera, more lighting options, better part separation, and higher feed rates. Model III feeders typically include a conventional or Model I rotary or vibratory bowl feeder which is used to feed parts one high and one wide on to the conveyor. In its simplest implementation good parts in the desired orientation are allowed to pass to the end of the conveyor while bad parts or parts in the wrong orientation are returned to the bowl feeder via the return conveyor. Programming the camera can be as simple as showing the camera the part in the desired orientation. Programming the entire Model III system typical only requires a couple of minutes. Feed rates of several hundred parts per minute are possible.